Dental fluorosis (W) occurs because of the excessive intake of fluoride either through naturally occurring fluoride in the water, water fluoridation, toothpaste, or other sources. The damage in tooth development occurs between the ages of 6 months to 5 years, from the overexposure to fluoride. Teeth are generally composed of hydroxyapatite and carbonated hydroxyapatite; when fluoride is present, fluorapatite is created. Excessive fluoride can cause yellowing of teeth, white spots, and pitting or mottling of enamel. Consequently, the teeth become unsightly. Fluorosis cannot occur until the tooth has erupted into the oral cavity. At this point, fluorapatite is beneficial because it is more resistant to dissolution by acids (demineralization). Although it is usually the permanent teeth which are affected, occasionally the primary teeth may be involved. In mild cases, there may be a few white flecks or small pits on the enamel of the teeth. In more severe cases, there may be brown stains. Dean's fluorosis index was developed in 1942 and is currently the most universally accepted classification system. An individual's fluorosis score is based on the most severe form of fluorosis found on two or more teeth. The condition is more prevalent in rural areas where drinking water is derived from shallow wells or hand pumps. It is also more likely to occur in areas where the drinking water has a fluoride content of more than 1ppm (part per million), and in children who have a poor intake of calcium. Fluoride consumption can exceed the tolerable upper limit when someone drinks a lot of fluoride containing water in combination with other fluoride sources, such as swallowing fluoridated toothpaste use, consuming food with a high fluoride content, or consuming fluoride supplements. Tooth bleaching, microabrasion, and conservative composite restorations or porcelain veneers are commonly used treatment modalities. Also, as a preventative measure, dentists recommend that children should not receive topical fluoride treatment until the age of three or at the earliest time that a determination can be made about a child's total flouride exposure. Elemental fluorine is prepared industrially by Moissan's original process: electrolysis of anhydrous HF in which KHF2 has been dissolved to provide enough ions for conduction to take place. This is not a practical synthesis, but demonstrates that electrolysis is not essential. - Compounds of fluorine, including SODIUM FLUORIDE, stannous fluoride (SnF2) and sodium MFP, are used in toothpaste to prevent dental cavities. These compounds are also added to municipal water supplies, a process called water fluoridation, though a number of health concerns has sometimes led to controversy. - Many important agents for general anesthesia such as sevoflurane, desflurane, and isoflurane are hydrofluorocarbon derivatives. - Fluconazole is a triazole antifungal drug used in the treatment and prevention of superficial and systemic fungal infections. - Fluoroquinolones are a family of broad-spectrum antibiotics. - SSRI antidepressants, except in a few instances, are fluorinated molecules. These include citalopram,escitalopram oxalate,fluoxetine,fluvoxamine maleate, and paroxetine. A notable exception is sertraline. Because of the difficulty of biological systems in dealing with metabolism of fluorinated molecules, fluorinated antibiotics and antidepressants are among the major fluorinated organics found in treated city sewage and wastewater. - 18F, a radioactive isotope that emits positrons, is often used in positron emission tomography, because its half-life of 110 minutes is long by the standards of positron-emitters. Sodium fluoride is an ionic compound with the formula NaF. This colourless solid is the main source of the fluoride ion in diverse applications. NaF is less expensive and less hygroscopic than KF, but otherwise the potassium salt is more widely used. Fluoride salts are used widely to enhance the strength of teeth by the formation of fluoroapatite , a naturally occurring component of tooth enamel. In the US, NaF was once used to fluoridate drinking water but its use has been displaced by hexafluorosilicic acid (H2SiF6) or its sodium salt (Na2SiF6). Toothpaste often contains sodium fluoride to prevent cavities. - In paticular Fluorapatite can be synthesized in a two step process. First, calcium phosphate is generated by combining calcium and phosphate salts at neutral pH.This material then reacts further with fluoride sources (often sodium monofluorophosphate or calcium fluoride (CaF2)) to give the mineral. 2P2 → P4 after cooling. The aquatic phosphorus cyclePhosphorus normally occurs in nature as part of a phosphate ion, consisting of a phosphorus atom and some number of oxygen atoms, the most abundant form (called orthophosphate) having four oxygens: PO4-. Most phosphates are found as salts in ocean sediments or in rocks. Over time, geologic processes can bring ocean sediments to land, and weathering will carry terrestrial . Plants absorb phosphates from the soil. The plants may then be consumed by herbivores who in turn may be consumed by carnivores. After death, the animal or plant decays, and the phosphates are returned to the soil. Runoff may carry them back to the ocean or they may be reincorporated into rock. 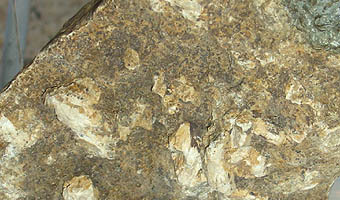 Hydroxylapatite, also often incorrectly called hydroxyapatite, is a mineral. It is a naturally occurring form of calcium apatite with the formula Ca53(OH), but is usually written Ca106(OH)2 to denote that the crystal unit cell comprises two molecules. The OH- ion can be replaced by fluoride, chloride or carbonate. Pure hydroxylapatite powder is white. Naturally occurring apatites can however also have brown, yellow or green colorations. Compare to the discolorations of dental fluorosis in aging. Seventy percent of bone is made up of the inorganic mineral hydroxylapatite. Carbonated-calcium deficient hydroxylapatite is the main mineral of which dental enamel and dentin are comprised. Hydroxylapatite can be found in teeth and bones, within the human body. Therefore, it can be used as a filler to replace amputated bone or as a coating to promote bone ingrowth into prosthetic implants. Although many other phases exist with similar or even identical chemical makeup, the body responds much differently to them. Coral skeletons can be transformed into hydroxylapatite by high temperatures; their porous structure allows relatively rapid ingrowth at the expense of initial mechanical strength. The high temperature also burns away any organic molecules such as proteins, preventing graft vs. host disease (GVHD). Some modern dental implants are coated with hydroxylapatite. It has been suggested that this may promote osseointegration, but there is not yet conclusive clinical proof of this.